Keeping your process on course. Connect with your HELM Force Monitoring Systems via the WebView Internet and you have started your program of Production Monitoring and Signature Analysis. 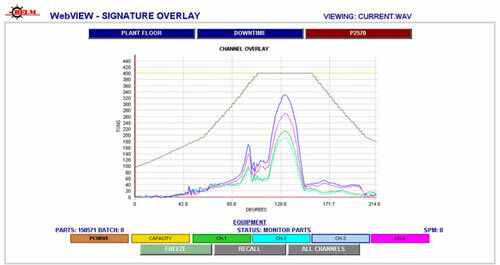 WebView is easy to use yet provides in-depth analysis tools for monitoring on and reporting your production runs. At a glance, you can see the status of each machine on Alarms or offline conditions are easily identified. Idle machines are tracked for Downtime reporting. WebView Signature Analysis tools are a mouse click away. Conventional load monitoring sets high and low tolerance limits on the peak loads. These loads usually occur at or around 180 degrees. There are many applications where peak load monitoring provides excellent machine and tooling protection. Resolver based load monitoring provides enhanced alarm detection. The resolver enables the system to set alarm limits, high and low, along the entire forming force. Helm systems, equipped with the resolver option, monitor up to 10 points per degree of rotation. And WebView offers users detailed display and options for setting alarm windows through the stroke. Plus, the press manufacturer can supply the tonnage curve data for us to digitize into the system. Now our systems can monitor the stroke relative to the press curve!